Big Finish: Doctor Who - THE BEAST OF KRAVENOS Review | Warped Factor - Words in the Key of Geek. Tony takes to the stage. Gets booed off. Introduces a tin dog. Doctor Who meets Jekyll and Hyde at the Victorian Music Hall. 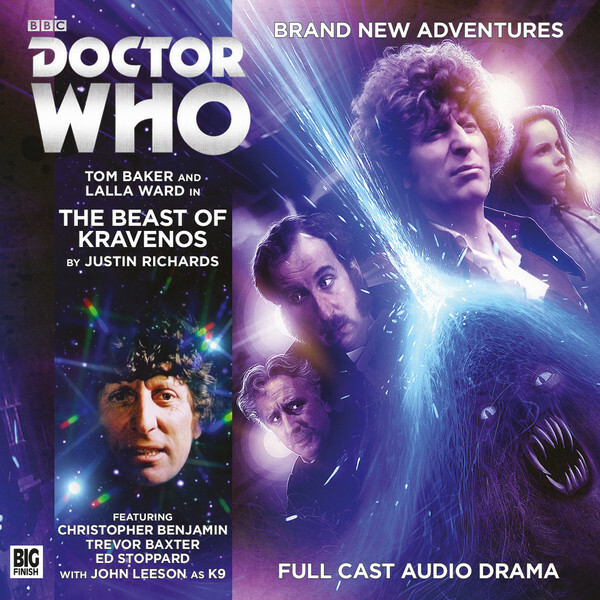 How you react to that sentence and that idea will more or less determine how you feel about The Beast of Kravenos, the first in the latest season of Fourth Doctor stories, because that’s more or less the ‘elevator pitch’ for the story. Of course, where there’s a Jekyll and Hyde, it seems to follow naturally that there’s a Jago and Litefoot, the Infernal Investigators coming along for this particular adventure, and adding significantly to the depth of its period feel, and to the amount of actual storytelling ground that Justin Richards manages to cover in what is essentially a two-part Classic TV-style story, as the redoubtable Victorians are by now, having twelve seasons of their own audio adventures under their belts, old hands at investigating the peculiarities, occultisms and alien shenanigans that seem to infest Victorian England, and so are able to take some of the burden of explanation and exposition off the shoulders of Tom Baker and Lalla Ward as the Doctor and Romana respectively. That makes for what feels like quite a busy script, given what is actually a fairly linear plotline. The Doctor and Romana have arrived back in Victorian London not by accident, but through one of those other gateways to adventure, a mysterious, anachronistic, alien signal coming from the heart of the Victorian empire. In fact, in a nod to some of Baker’s later stories, Richards plays boldly here, with all that having happened off screen before we even get into the story. We open with the time travellers and the Infernal Investigators all at the New Regency theatre, Jago’s haunt in recent years, watching the miraculous K9 as he wows the crowds onstage. Beyond that though, there are three threads of mystery in the story – the source of the alien signal, a mysterious criminal who breaks into locked rooms and steals not very much at all, leaving a single playing card as his or her calling card, and reports of a wild beast-man stalking the streets of Olde London Towne. How many strands of mystery there actually turn out to be would be telling, but Richards is accomplished at moving his stories along at something close to bullet-speed, while allowing for some lovely stuff and nonsense along the way. It’s rather glorious that in some instances, the stories with Lalla Ward’s Second Romana are picking up threads from stories in which Mary Tamm’s First Romana featured – Wave of Destruction had her and the Doctor sitting around the Doctor’s house in Baker Street, picking up from the First Romana’s mooching about there in The Auntie Matter, the inference being they’ve simply been sitting around there for about forty years. This story picks up from the last time the Fourth Doctor ran into Jago and Litefoot with a Romana in tow, in The Justice of Jalxar, though if we’re being critical, and assuming that this story takes place in the Jago and Litefoot timeline after they’ve met and travelled with the Sixth Doctor, Jago’s gag line here about how remarkable it is that the Doctor should know two entirely different ladies named Romana doesn’t work. Niggles, niggles, all is niggles. The thrust of the story – how a thief seems to do the impossible, and why they’re not an especially effective thief once they’ve done it, where the alien signal comes from, and what’s the truth behind the beast-man rumours is elegantly propelled, with Jago and Litefoot handling more than their share of the investigative burden. Is the resolution especially surprising? Mmmmno, perhaps not – early on, you begin to suspect things are not what they seem, and as soon as some particular characters are introduced, you suspect you understand exactly what’s going on, and you get it more or less right. But as much as any other story in the range, this isn’t about radically surprising the audience, but about the enjoyment of a series of familiar characters interacting again, with a new addition or two to the gang, the Second Romana and K9 here doing their traditional thing in new surroundings – K9’s blaster even runs out of power, in classic K9 fashion. That said, there’s enough that’s interesting about the way Richards reveals his story elements to keep us hopping along for the full hour, even if towards the end, there’s a certain similarity of environment to the first Jago and Litefoot tale, The Talons of Weng-Chiang. This story is high-quality nostalgia, because in a way it’s quintessential Fourth Doctor material – it’s more or less the Jago and Litefoot story they would have made on screen in Season 19. The Fourth Doctor and Victorian times is a fantastic match, because Tom Baker’s portrayal of the Time Lord always skews towards Sherlock Holmes if you give him the excuse to do so, and this story does. Wandering around the London stews and music halls, looking for both a thief who can break into anywhere without disturbing a single lock, and more worryingly, a slavering hairy homicidal beast on the loose, suits Baker’s Doctor down to his boots. Tracing the strange signals leads the Doctor and his friends to do a bit of classic Holmesian sleuthing, tackling the age old question of how you get in and out of a room without unlocking the door or opening the window, and in the process, uncovering the origins of the werewolf-like beast that’s terrorising the city. There’s the Jekyll and Hyde element we mentioned in the solution to all these questions, but there are other influences too – in its blend of horror and comedy themes, The Beast of Kravenos feels a lot like An American Werewolf In London. Only without the American. An Alien Werewolf In London, perhaps? Certainly, while dealing with several gothic themes, including the animal within, the use of science as a transformative agent, and the foolishness of meddling with things you don’t fully understand (as scientists were keen on doing throughout the whole Victorian era, sometimes to their cost, and often to the enormous advancement of civilised society), there’s a modern sense of whimsical comedy to the whole thing too, so it never feels heavy going or unnecessarily dark. Darkness with comic whimsy could be stamped on Tom Baker’s passport, so he eats and drinks this story, with impressive support all the way down the cast list – Lalla Ward as Romana has eyebrows you can almost hear raise in nice-girl scorn; John Leeson’s K9 is given some fantastic comedy lines, both on the music hall stage and off it. Jago and Litefoot (Christopher Benjamin and Trevor Baxter respectively) are old hands at the investigation business, and Richards is the writer most responsible for writing them over their twelve series, so what The Beast of Kravenos amounts to is a pacy, often highly comical gothic story of transformation, theft, alien tech and scientific tomfoolery that never loses sight of either its scares or its science fiction credentials. In essence then, it’s the best of quite a few worlds, all spinning together over the course of two fast half-hour episodes. Take The Beast of Kravenos for a spin. You’ll laugh, you’ll bite your nails, you’ll worry. You’ll love it.